Oyunohara (大斎原) is the former location of Kumano Hongu Shrine. Historically speaking, all people headed to this place. In 1889, the shrines are destroyed by flooding. Those buildings were moved to the top of a hill located little north. This place was used to be an island surrounded by Kumano and Otonashi river. Instead of Misogi, visitors must walk though the cold river to worship. 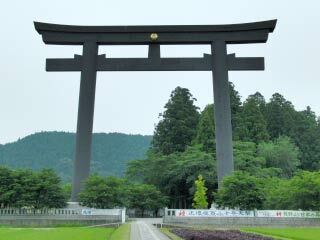 There is a largest Torii Gate in this place. 1. use local bus to Kumano Hongudaisya. The ruins of Kumano Nimasu Shrine, current Kumano Hongu Shrine, was located on a sandbank surrounded by Kumano RIver, Iwata River and Otonashi River. In 1889, most of the building had lost, but the main shrines survived and moved to current location. Tallest Torii, 34m tall and 42m wide.